There is a famous passage in the Psalms that I’m sure you’ve read or heard of. 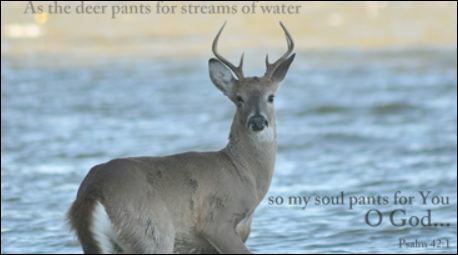 The first two verses of Psalm 42 say, “As a deer pants for flowing streams, so pants my soul for you, O God. My soul thirsts for God, for the living God.” I’ve seen pictures of this deer along a flowing stream and in those pictures the deer is strong, healthy, well fed, and usually looking up toward the viewer. The picture of a hungry and thirsty deer should really be one that shows a scrawny, weakened, and emaciated deer. To “pant” after water implies a long absence of water. A deer satiated with water would never pant for it. A deer well fed would not “hunger” for anything. When Jesus spoke to the crowds gathered around him on the hillside in Matthew 5, he was speaking to the thirsty crowds. It was those who yearned and hungered for a connection with God who came to listen. Those who felt they already had the connection with God were not interested and did not respond to Jesus teaching. Those who know they are sinners are truly thirsty. Those who already believe they are righteous are not. He said, “blessed are those who hunger and thirst for righteousness, for you will be completely satisfied.” The religious leaders already felt they had it all and didn’t need what Jesus had to offer. They believed their standing as Priests, Levites, Rabbis and Lawyers: All Pharisees and Sadducees had exempted them from God’s judgment under the law. They were already righteous in their own estimation. But the law, just like the desert, will dehydrate any soul who honestly faces up to its demands. Religious leaders and lawyers minimized the law and by redefining it to suit their own purposes believed they had met its standard. Jesus used the law to emaciate the proud and dehydrate the arrogant. He presented it to them in his teaching in a way that it would drain all the fat of self-confidence and bring a real hunger to the soul. Jesus assured His listeners that they would be ‘filled’ with righteousness. I don’t think he was referring to some future kingdom in the next world. He was speaking of the time after which he would die and pay the penalty for us all for our failure under the law. Those who believed in Christ and His payment for our penalty would indeed be “filled.” But the filling would not be with our own righteousness, but with HIS! The hunger we have for righteousness will be satisfied with the bread of life. The thirst that often drives us to our knees will be completely satisfied as we drink of the water of life that Jesus offered to the woman at the well as well as to us. He satisfies our hungers! He quenches are thirst! Blessed are you who hunger and thirst for righteousness, for you will be completely satisfied.” He will be our righteousness!